Started the day with a trip to Largs Yacht Haven to look around the boats for sale, visit the Chandlery, and decided to have lunch in the reopened Bosun's Table; a perfect way to start any day. From here we proceeded down to Portencross Beach for a relaxing sit in the sun and a stroll along the waterfront. On our stroll we spotted a few of the regular birds but also a couple not seen as regularly. 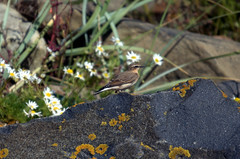 The surprise to us this summer is the number of wheatear around the beach. In the last few years I have maybe seen these once before, but this year they are here in numbers. Maybe it is something to do with the quantity of seaweed left on the beach which is more than I can remember in previous years. In addition, we were lucky enough to come across twite; a new addition to my sightings record. The day's sightings included: housemartin, swallow, rook, carrion crow, lesser black-backed gull, herring gull, black headed gull, sandwich tern, redshank, pied wagtail, white wagtail, cormorant, curlew, ringed plover, dunlin, meadow pipit, twite, wheatear, oystercatcher, gannet, jackdaw and starling. Well, a late rain shower around lunchtime cleared to allow us down to Portencross Beach. A nice walk from the castle to the beach allowed views across the various arable fields. Once on the beach we were combing for interesting shells and then walked around to our usual rocks to sit and look across to Arran. Fuelled by jelly babies, we logged the various passing birds: carrion crow, rook, lesser blacked back gull, herring gull, black headed gull, oystercatcher, ringed plover, wheatear, linnet, redshank, starling, housemartin, swallow, house sparrow, wood pigeon, robin, curlew, pheasant, cormorant, gannet, pied and white wagtail. Jelly babies not constituting a main meal, or even one of your five-a-day, we headed back to the castle then home for mediterranean chicken with orzo pasta; delicious! Well it is good to get out again. It has been months since we had a chance to have a walk together. Coming up to Scotland for a weeks break is just the ticket, even if it was an 0500 alarm call. The forecast for the week doesn't look good so we thought we would take the opportunity to pop down to the beach for a walk. No rain, so straight away better than the forecast. That is one of the great things about this coastline, the weather forecasts are almost useless as the weather can be just the opposite. Tried out my new 10x42mm "spare" binoculars - absolutely amazing for the money! Black rubberised body for extra durability and non-slip grip. Compact BK-7 roof prism design and powerful 10 times magnification is ideal (glass multi-coated) and provides incredibly bright and super-clear viewing for just £29.99; got hem here. Straight away we spotted the seals bobbing out near the rocks. Always a joy. A few birds spotted too: pied wagtails, swallow, housemartin, lesser black backed gull, herring gull, yellow legged gull, black headed gull, oystercatcher, redshank, wigeon, starling, gannet, greenfinch, meadow pipit, cormorant, curlew, jackdaw, carrion crow, linnet and mute swan. For the first time in a while we also saw a submarine, part submersed, cruising over towards the Arran coastline. Lets hope that tomorrow's weather is as predicted and we get a dry day before the rain storm forecast for Monday arrives.